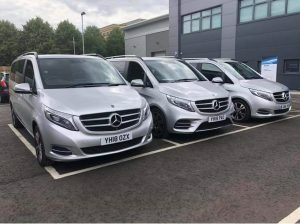 The Mercedes V-Class is an excellent choice for chauffeur-driven travel for large parties of up to 7. 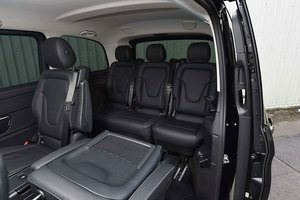 This luxury people carrier is ideal for groups or individuals who want a spacious vehicle for business or private travel. Inside there is conference style seating, ideal for business meetings or discussions with your team, whilst travelling to your destination. Furthermore, the vehicle is equipped with electronic sliding doors, for easy entry and exit for large groups. 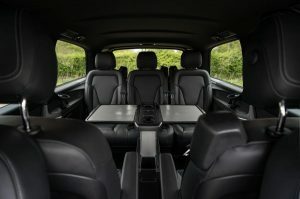 In addition, the Mercedes V Class is also equipped with mobile phone chargers, air-con, 4G Wi-Fi and complimentary water. We’re professional experienced chauffeurs, who are 100% reliable and punctual. In addition we are dedicated to providing our clients with a higher level of service and customer satisfaction. And it’s our goal to ensure your safety and comfort, from the time we pick you up until the time we drop you at your destination. In addition all cars come with a fully licensed, comprehensively insured CRB certified chauffeur. Finally we provide a discreet and reliable executive car service. Our excellent customer service and attention to detail means we are the perfect choice for prestige corporate travel.